Join us in celebrating the life and work of Stitches in Time’s founder, Diana England, in an exhibition at the Mile End Art Pavilion. Dates 21st – 26th July. How can sewing bring people together? Starting in 1993, artist Diana England united over 3,000 people in the creation of The Millennium Tapestries. 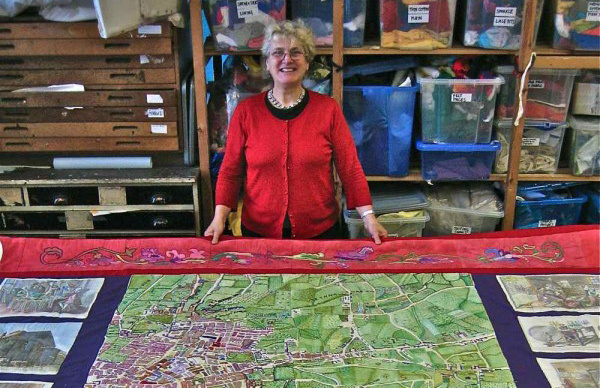 This project brought together Tower Hamlets’ residents to make 50 large textile art pieces, each hanging richly illustrating East London’s social history. Over seven years, a mixture of ages, cultures and religions met at community locations to embroider, silk paint, screen print, dye and embellish. With titles like River Traffic Today, Roque Map & Jewish Wedding, these pieces combine local history, textiles and community arts at its highest quality. By creatively exploring the past, history was not only being represented but actively being made in the weaving of communities together. Seeing the positive impact this had, and a desire from the community to continue, the arts charity ‘Stitches in Time’ was formed. The Millennium Tapestries exhibition will show a selection of these historic pieces, brought together for the first time in seventeen years. Also on show will be some rarely seen work from this huge textile archive. See how ‘Stitches in Time’ has developed over time. Be part of the creation of our newest textile piece at various free workshops during the exhibition. It will also be a unique chance to hear recordings of the Stitches in Time founder, Diana England, describing the project and the basis of her final work – a book about the project, launching on the 20th July 2017 at the exhibition. Join us for this celebration of the life and work of Di England, whom over 25 years has made an immeasurable contribution to community arts, and touched the lives of thousands of people through her charity Stitches in Time. There will be a series of free, creative workshops from 21 – 26 July.